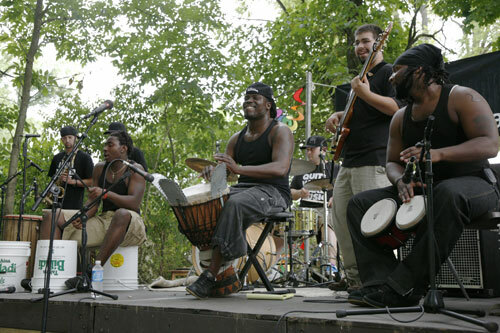 Experience HeartBEAT Afrika’s style of percussion using trashcans, buckets, African drums, conventional drums, and rhythms played by feet, body, and hands. This ensemble performs street and traditional African percussion, song, storytelling, theatre, and dance to preserve traditional African music in America. Grab a blanket and picnic dinner, and bring your family to hear FREE music in the national park! The celebration begins with lawn games and activities for families and friends. The concert series is presented by CVNP and the Conservancy for CVNP with support by AudioTechnica U.S., Inc., Woodsy’s Music, Audio & Video in Kent and Medina , and the Lloyd L. and Louise K. Smith Foundation. Alcohol is prohibited. Donations to support this series will be accepted at each event. Howe Meadow activities begin at 5:30 pm and the concert begins at 6:30 pm. After the concert, cap off your evening with a ranger-led walk or a Twilight Talk with a Ranger. Concerts will be cancelled during severe weather. Call 330-650-4636 ext 228 after 2 p.m. on the day of the event for current updates. This entry was posted in akron, Art News, dance, music, ohio, shows and tagged akron, art news, concert, cuyahoga valley, CVNP, HeartBEAT Afrika, live, music, ohio, show. Bookmark the permalink.